I recently had the delight of replaying one of my favorite video games, Donkey Kong Country 2, and I found it rather amusing that after all these years and after all these improvements in the world of gaming, none of the fun of DKC2 has been lost. I don’t care if games nowadays are so much more advanced, the graphics are better, and we have nifty wireless controllers and giant, widescreen TVs. DKC2, even compared to all the new technology we’re all so excited to try out, is still amazing. And as I worked my way through the game, my response to it was still the same as when I first started playing it over a decade and a half ago. The ghostly ropes in Ghostly Grove still freak me out. The pirate-themed Kremlings are still pretty darn cool, and Dixie is adorable with her little juice box. And I still feel the same rush of adrenaline when racing the Klanks in Rickety Race and the same tension when traversing, well, pretty much any lava level. There is one level in particular, however, that I think really stands out, and that is Haunted Hall. This is one of the game’s mine cart levels, but in addition to navigating tricky rails, you have a ghostly presence to contend with. 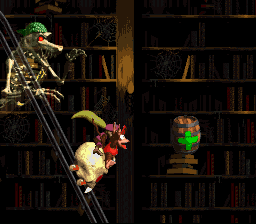 The location appears to take place in a haunted library, with the back wall lined with books and cobwebs, and the music is perfect for getting across the terror you will soon be feeling, thanks to this level’s resident Kremling specter, the bone-chilling Kackle (pun intended). This ghoul is the reason this level is so memorable for me. As you play through Haunted Hall, you pass through gates, after which awaits one of the frightening apparitions, who will pursue you as a timer counts down. Hitting green barrels gives you more time, while hitting the red barrels reduces your time. If you run out of time before getting through the next gate, Kackle will be more than happy to take away one of your characters. Mwahaha! I have so many fun memories of playing through this level, of the tension I feel when that timer starts to run down. I have died many times in this level after Kackle has caught up with my characters, and I had many near-misses, as well, after I passed through the next gate with hardly a second to spare. This game may be over two decades old, but that is all the more reason it stands as a testament to how great games were during the bygone era of cartridges and control pads. Donkey Kong Country 2 is a perfect example of how good games were back when they were simple and lacked all the bells and whistles of modern days, features that make games look better on the surface, while adding nothing truly worthwhile. DKC2 is a masterpiece, and I was more than happy to buy it a second time. I can’t say the same for many of the new games I now own. If you have yet to play this game, please try it out. And if you already have the pleasure of owning it, please share your experiences. Previous Post To the Lighthouse! DKC2 is the best sidescroller of all time! It is as simple as that! It certainly is. I’ll never get bored of this game. It is gaming perfection. I know I played DKC2, but I think I played the first one more–I don’t really remember this stage. Still, I love ghostly stuff in otherwise non-ghostly games. Ah, SNES, take me away. I love ghostly stuff, too. Or anything scary. I loved Kackle and the ghostly ropes in DKC2, and I liked the Rock Crocs in the first game, too. They always scared me enough that I’d just take the shortcut through the level. So frightening. I loved the ghost houses in Super Mario World. The music was the best. I loved those, too. Those were my favorite levels. Ghosts are awesome.